UK newspaper The Telegraph recently published a story titled: Are These The 15 Worst Jobs In Travel? Here’s a quick summary of a few of the top (bottom?) worst jobs. You can see the rest here. When the role was previously advertised, it was referred to as “the worst job in Ireland.” A successful candidate, the job ad stated, required “thick skin,” “saint-like patience” and “an aversion to bolloxology.” Enough said. Once seen as a glamorous role, flight attendant was ranked 191st out of 200 career choices in a 2013 survey. High stress and low pay were among the reasons. The good news: in this year’s Careercast.com survey flight attendant leaped up to 178th. 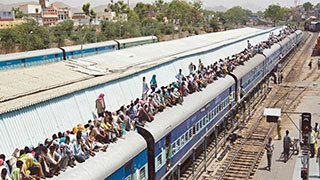 Not much to say here, other than that unless you’re riding on the Orient Express, rail travel in India is often insanely crowded and far from luxurious. OK, that’s a weird one alright. Not sure about worst, as there could be worse places to ply your mortician trade, like an inner-city U.S. hospital. All large cruise ships have mortuaries where up to 3 bodies can be stored until the ship reaches port. But the deaths tend to be of natural causes, usually related to age. One beach in Brazil has seen 50 shark attacks in the past 25 years, resulting in 19 deaths. Would you want to be the one swimming out to offer help?